Evidence-based management of TMJ problems is limited with few randomized control trials. Although TMJ diseases were managed surgically, this is changing, and the vast majority is medical/non-surgical or minimally invasive. 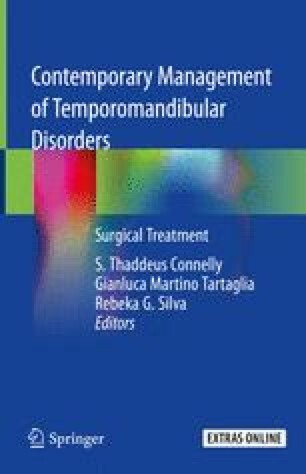 The management of temporomandibular joint conditions is an established area of subspecialization as they are common, and they contribute to a substantial workload in oral and maxillofacial units. Initial management with non-surgical or medical treatment is successful in most cases, as a result of advances in analgesia and the introduction of botulinum toxin injections. Since the pioneering work by Ohnishi, initial surgical management has largely changed from open operations on the joint to the use of arthroscopy for therapeutic and diagnostic benefit. Increasingly multidisciplinary approaches to TMJ treatment have more structure and science to their planning. Open surgical approaches to TMJ diseases have specific indications and should be done at specialist centres. To that end, this chapter details anatomic pathways that are used for open surgical access to the joint and related structures. The online version of this chapter ( https://doi.org/10.1007/978-3-319-99909-8_3) contains supplementary material, which is available to authorized users.